Fusing classic European design with simple rustic charm. 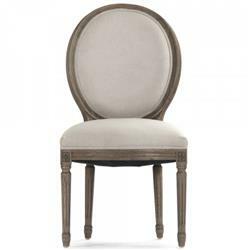 A natural reclaimed oak finish adds an antique touch to this Louis XVI style Medallion side chair. Upholstered in natural linen with an acanthus leaf screen print, this traditional oval back chair lends vintage elegance to a dining room.